RedDot™2 is a far-red cell membrane-impermeable nuclear dye similar to Draq7™. The dye is ideal for specifically staining the nuclei of dead cells with minimal cytoplasmic RNA staining. 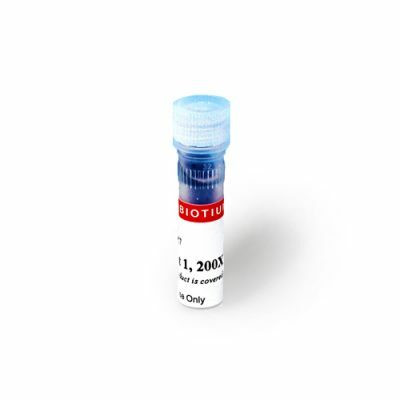 RedDot™2 provides excellent nuclear counterstaining in fixed and permeabilized cells and tissue sections without the need for RNase treatment to remove cytoplasmic RNA. The dye is highly thermostable and photostable, providing convenient handling and ideal for demanding applications such as confocal microscopy. RedDot™2 also has been used for cell number normalization for near-infrared In Cell Western™ (see reference 5). RedDot™2 can be efficiently excited by wavelengths from 488 to 647 nm, and therefore can be used with the 488 nm flow cytometry laser line. RedDot™2 is dead cell specific in all cell types, including mammalian cells, bacteria and yeast. See our Cellular Stains Table for more information on how our dyes stain various organisms. Please note: far-red dyes like RedDot™2 are not visible to the human eye, but must be imaged with a CCD camera or by confocal microscopy. Please also see RedDot™1 (catalog no. 40060), a spectrally similar dye designed for specific nuclear staining of live cells. In Cell Western is a trademark of LI-COR® Biosciences. Cy dye is a registered trademark of GE Healthcare. Draq7 is a trademark of BioStatus Ltd.
23. Oncotarget. (2017), doi: 10.18632/oncotarget.16934.